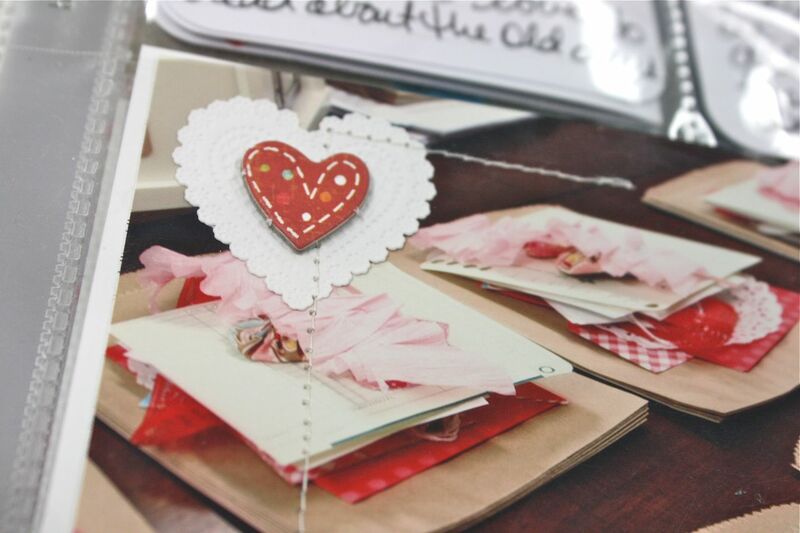 Welcome to the February Papertrey Senior Team post. Today we are revisiting Sweet Love, a classic stamp set full of timeless elements and nice sentiments suitable for weddings, anniversaries, Valentine's Day and more. The cards came together so easily because the ovals and circles are so easy to die cut with Nestabilities dies..or you could use punches too. The pretty colors seem to just pop right off the white background. I used the Sunshine Impression Plate on my white cardstock. So subtle but the impression is definitely visible. 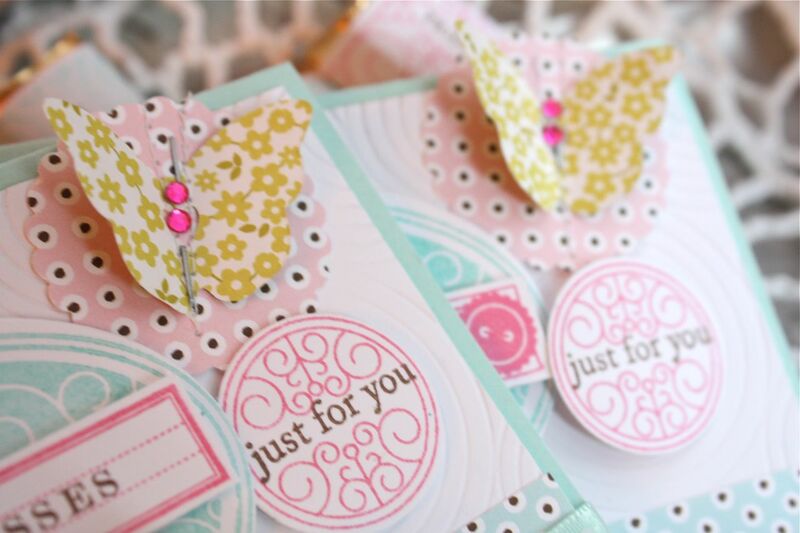 The cute butterflies were die cut from the Love Lives Here Collection. 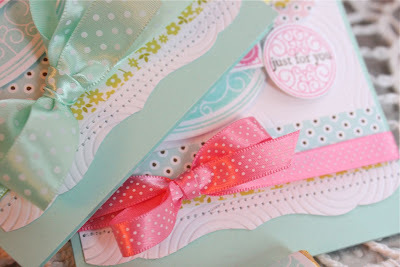 I love all the Papertrey dies...so easy to add little accents here and there. 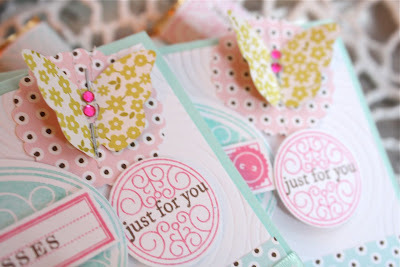 A few staples and some Raspberry Rhinestones finish off the pretty butterflies. The sentiments on top of the oval images were stamped on some rectangular labels from the Mat Stack 3 Collection. Loving those. 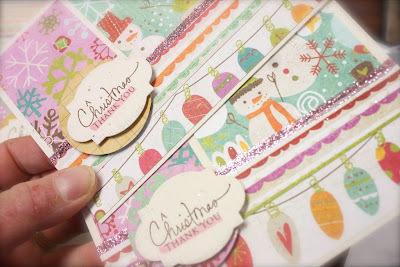 To fancy up the bottom of my cards, I used the Edgers #1 die collection on the white cardstock. To get your edge to stay put in the die, I suggest placing a piece of clear tape on edge of paper that will be discarded. This keeps the paper in place while going through your die cut machine. Some snippets of patterned paper, some machine stitching and pretty ribbons in Aqua Mist and Berry Sorbet finish off the cards. 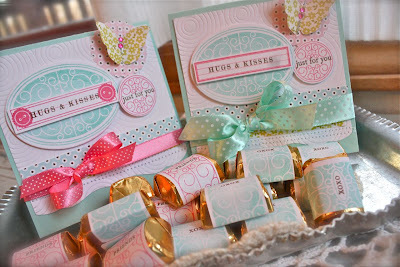 Moving on the candies, I used Papertrey's White Mailing Labels and some of the stamps from Sweet Love to create some nugget labels that match my cards. There are two stamps as you can see that were designed to fit on the labels. There are several small words that can be stamped inside the little oval on the label image too. I used *friends* and *xoxo*. 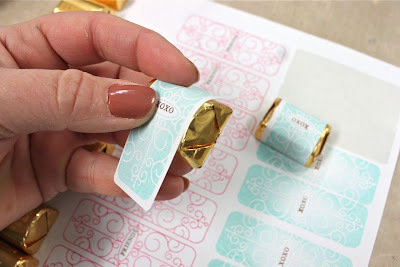 Once you've stamped all the labels needed, simple peel off the labels and wrap them around Hershey's nuggets. These make adorable little candy favors...would be so cute for teacher treats, weddings or baby showers too. A sweet little set of goodies for my lovable little reds. Need a fast but oh so sweet gift for Valentine's Day? It's coming up soon. 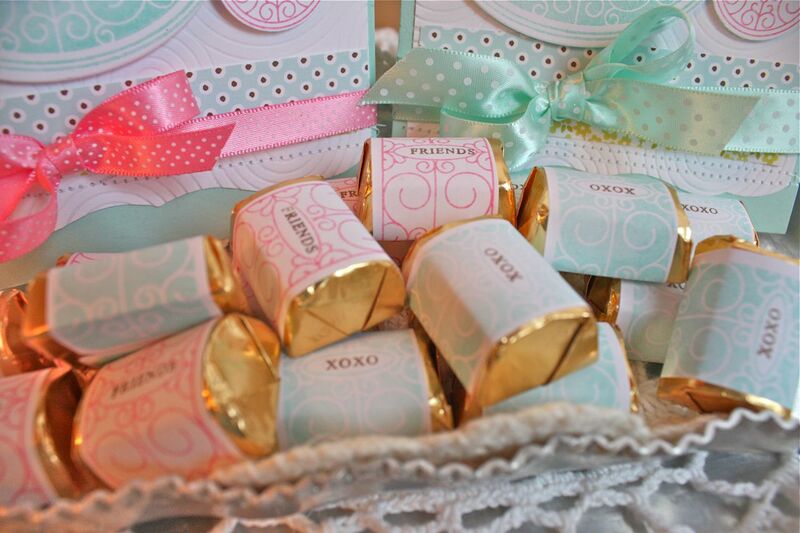 :) Candy is the ultimate quick and easy gift and with a little fun packaging, you'll have a basket full of gifts in no time. Here I've used my long Notebook Slicks to package up two regular size Reese's candy bars and 4 Ghiradelli raspberry filled chocolates. The entire family can enjoy this sweet little package. You could also fill the Notebook Slicks with items like Pixie Sticks, packages of gum, licorice whips....lots of possibilities for the goodies you can tuck inside. Thanks for stopping by today. Stay warm! EDIT: Wow, you guys shop fast. The Yo Mamas are sold out right now. My mom is tickled pink. She's probably whipping up yo yos as fast as she can! Thanks so much, you made her day!! Hi friends. Watching the winter weather progress here in Kansas. Freezing rain right now with possibly 10" of snow coming. What? So much for my thoughts of Spring, right? 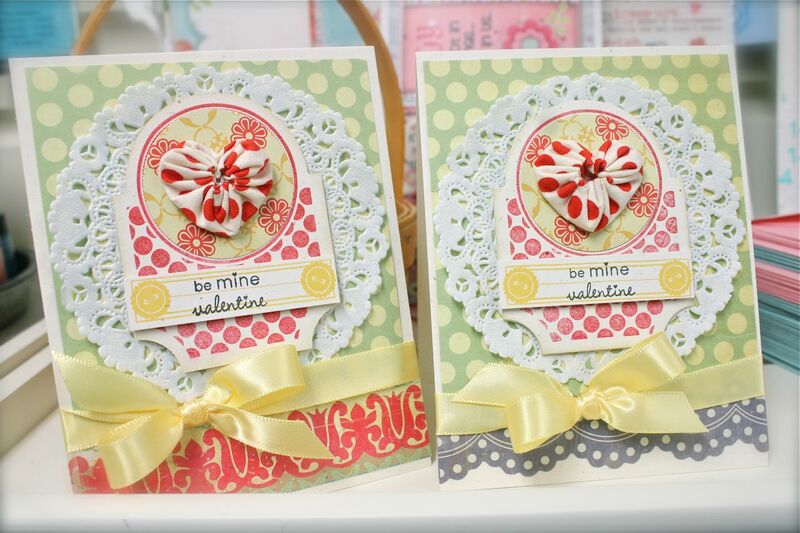 Today I have some adorably sweet cards to show you along with a new addition to my Etsy shop. If you've been following my blog then you know that my mom has been stitching up Yo Yo's like crazy. Each day she brings me over her little completed Yo Yo's in a baggie. After building up quite a stash, I think it's time that I share some with you. But first, let's see what we can do with Yo Yo's. Using inspiration from Tara Anderson, I created these shabby, layered cards featuring Friendship Jar and the coordinating jar die. 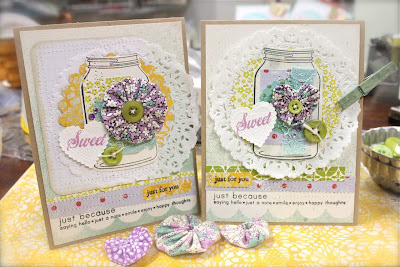 On the stamped and die cut jars, I stitched on layers of patterned paper and lace. A purple Yo Yo with a stitched on button was added on top. 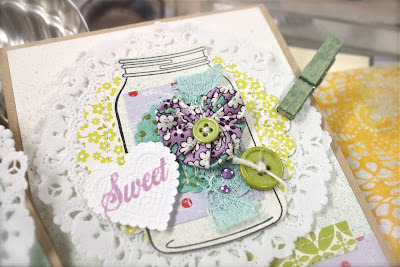 Behind the jar is more die cut patterned paper and a Dainty Doily. 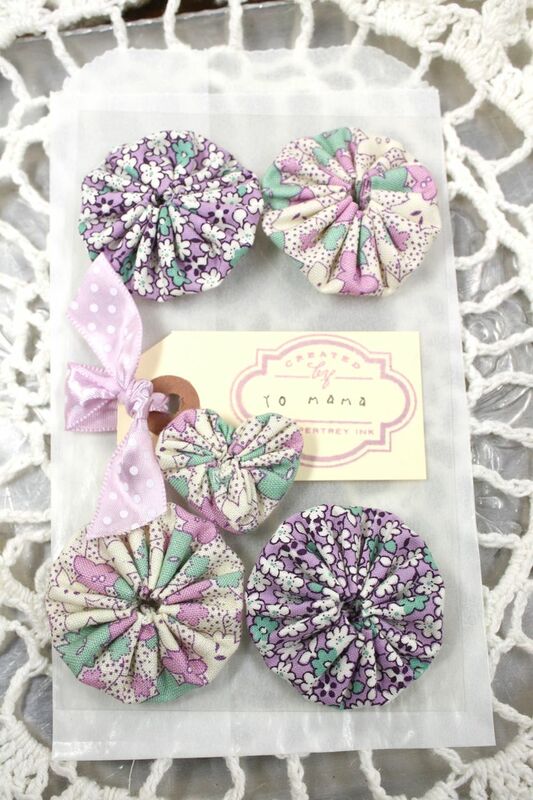 Extra Vintage Buttons tied with Rustic Twine, rhinestones(you can find other colors from PTI here) and small stamped hearts were the finishing touches. 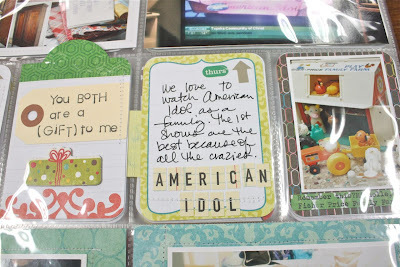 For the bottom of my cards, I reached up on the shelf for my misters to create a fun sentiment accent. 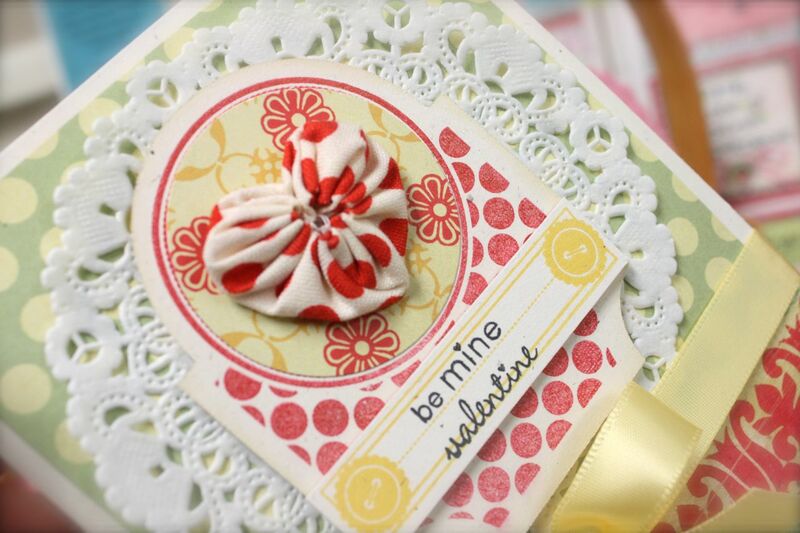 Using a PTI scalloped border die, I cut a piece of scrap paper and masked off a scallop on my cardstock base. I sprayed the mist to create a white blank area. This is where I stamped my sentiment from Simple Sentiments. 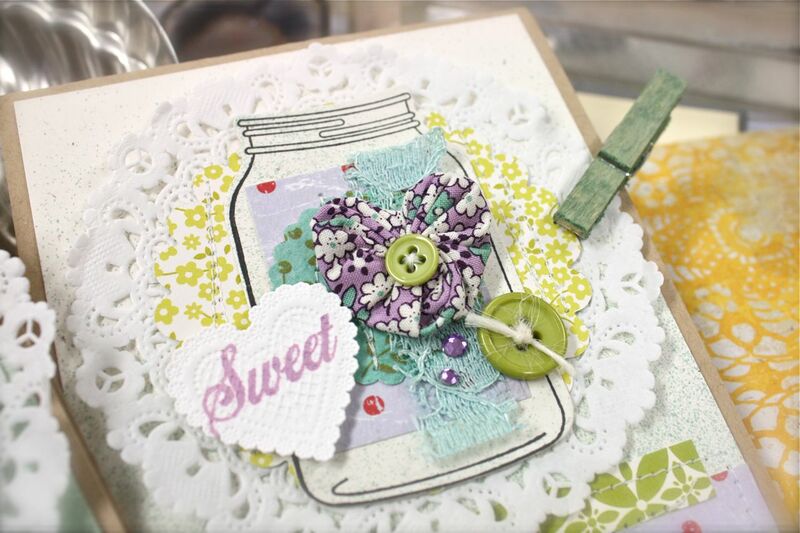 A great way to add faux texture and dimension to card without creating extra layers. Above the sentiment I added some scrap snippets of patterned paper, securing them down with my sewing machine. The small label punch is from EK Success, also pulled down from the shelf. Oh how I love these shabby, sweet cards. 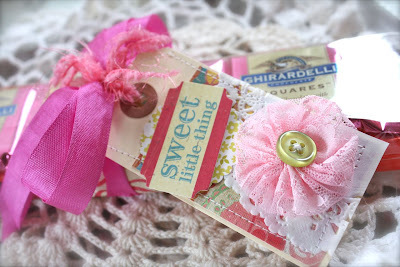 If you'd like to create some cards like mine, I'm now offering my mom's sweet Yo Yo's in my Etsy shop. I'm offering up a package of 5 Yo Yo's (four large circles and one small heart). They're packaged up oh so cute and are ready to go. They come adhered to a plastic sheet with a cute Created by Yo Mama tag and ribbon. Hi friends. Hope you're having a great weekend. We've been enjoying some beautiful weather in Kansas..which makes me long for spring, green grass, a growing garden and flowers. But alas, the weatherman forecasts more winter is on it's way including freezing rain and snow. Blech. I wanted a card design that would let me use lots of patterned papers because I loved ALL of these cute patterns from Crate Paper. Have you seen their newest releases? They are my favorites that I've seen from all of the new releases this season. I believe I ordered these from Emma's Paperie. Since the papers were so colorful and full of design, I didn't need to add much more to my cards than a few accents and a sentiment. The sentiment I used was from Dawn's Signature Christmas stamp set. I first die cut the Tea for Two label, stamped on the sentiment and then highlighted the word *thank you* with a Copic marker. 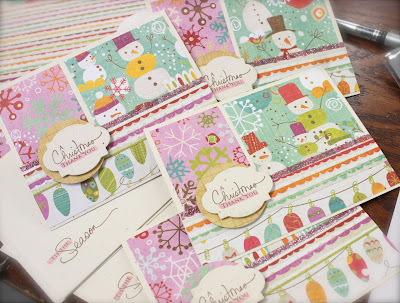 I used a circle punch of a reverse pattern from the Christmas papers behind the label. 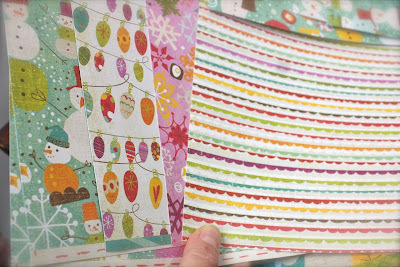 Using a strip of Scor-Tape, I added some colorful glitter along the horizontal strip of paper. Just the right amount of glitz to pretty things up a bit. Hope you enjoy! Today the girls have softball practice..seems weird right? We're gearing up for Spring ball.....looking forward to playing a tournament at an indoor facility. That should be fun! 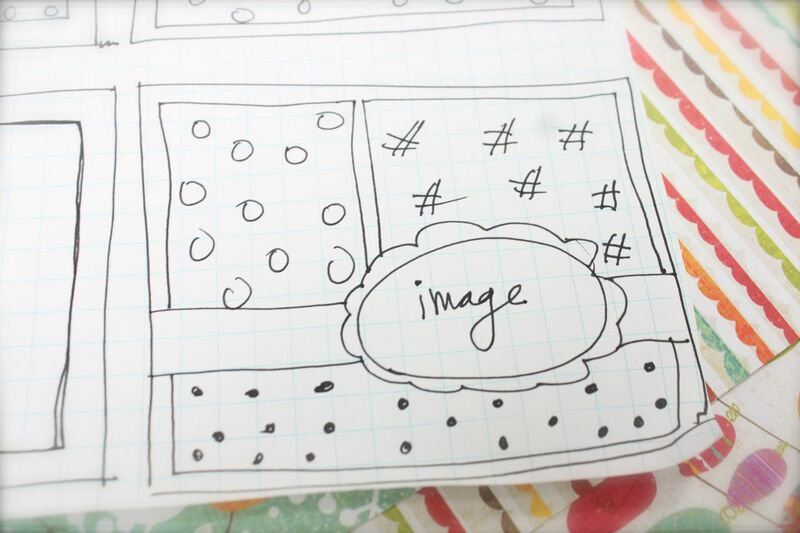 I'll be in my studio working on new Papertrey projects for February. It's going to be such a fun release with all the PTI anniversary festivities. One of the prizes Nichole has in store is unbelievable. You will flip out!! My lips are sealed for now though. Happy Saturday, my blogging friends! Today my great state of Kansas celebrates it's 150th birthday. I am so proud to be a born and raised Kansas farm girl. As Dorothy would say, *There's no place like home*. If I had ruby slippers, I'd be wearing them today!! 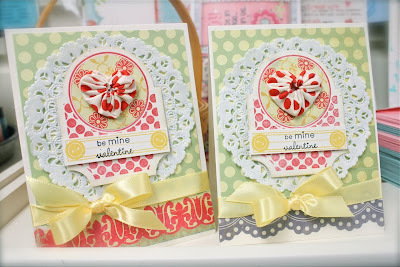 Today I have some sweet Valentines to share with you. Front and center are some sweet little heart yo yos that my mom has been cranking out. She's a machine, I tell ya! Stay tuned for a fun addition to my Etsy shop soon. :) The background papers for my cards are from Cosmo Cricket. 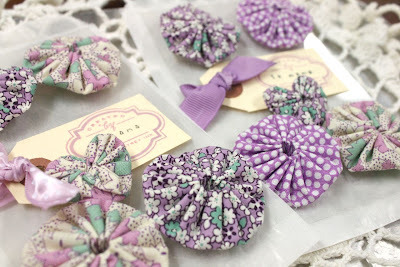 The Dainty Doilies are from my Etsy shop. Especially love them for Valentines. (Note: The views on Etsy are looking weird right now...probably a technical difficulty). 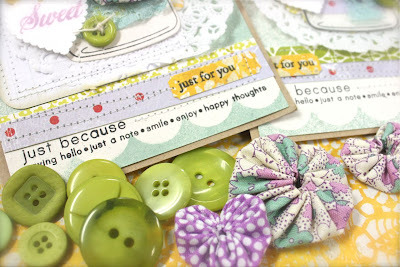 For the main focal point of my card I used the new Mat Stack 3 Collection of stamps and coordinating dies. A 1-3/4" circle punch or die fits perfectly in the center of the Mat Stack 3 image. Love to add a burst of patterned paper in there as a background. Am also loving the little label images that come with this stamp set. 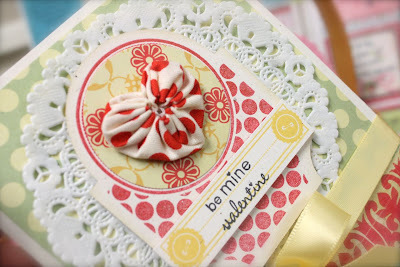 I used the one with little buttons on it and stamped a sentiment from the 2010 Love Tags stamp set. 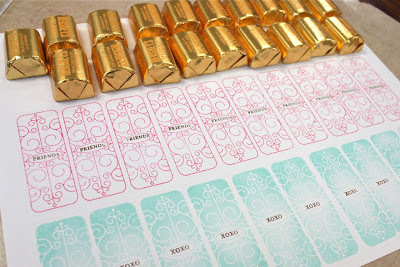 I would love to see dies for all of these little labels, wouldn't you? 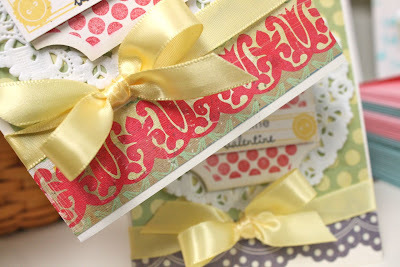 I finished off my cards with some sweet Lemon Tart Luxe Satin Ribbon. 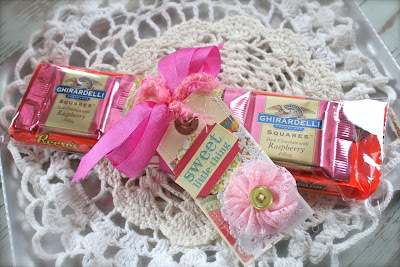 Oh how I love pretty little bows. I hope you enjoyed my Valentines today. I noticed that Nichol Magouirk posted a card featuring the Mat Stack 3 stamps and die. You can check her cute get well card out here. For the rest of the day.....my mail lady delivered a box today. My Papertrey box. Oh my craftiness, are you guys in for a treat for February!! I am super dee duper excited!! I'm off to my studio to start working on projects today. Also it's the KU vs. KSU game. Go cats. Alway a fun rival...especially since we're a divided family. Lots of yelling and fun stuff like that! Attention please. Not too hard with a photo like the one below, right? 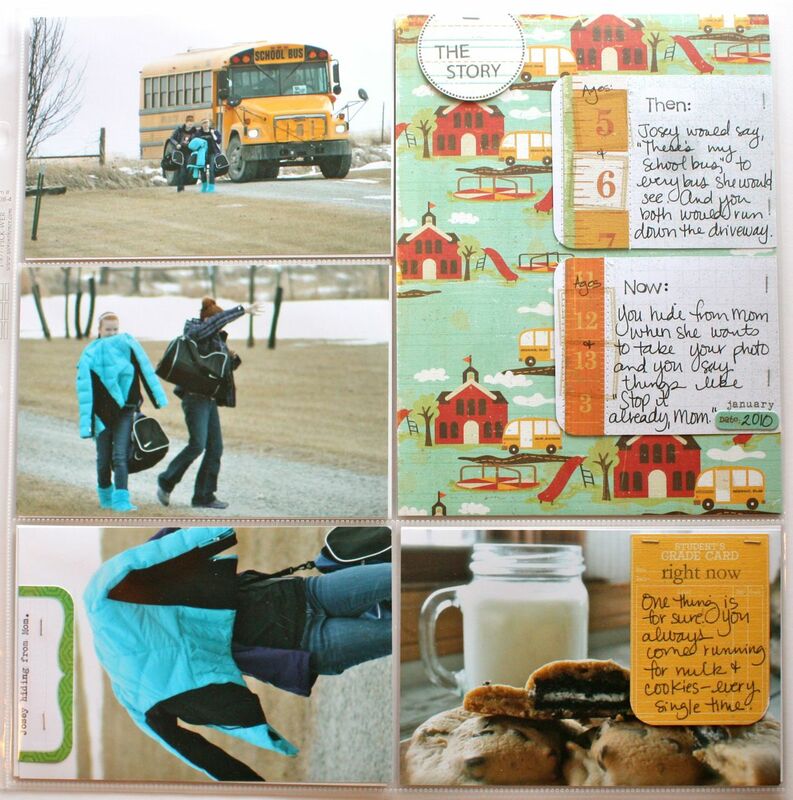 Some of you had a keen eye for cookies and saw this photo in my Project Life albums. Deliciously sinful, I tell ya. 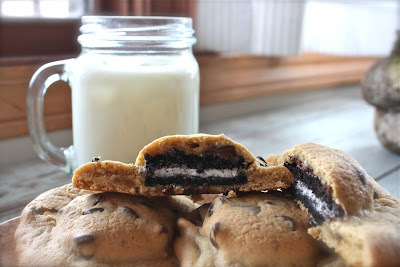 The recipe is called Chocolate Chip Oreo Sandwich from Picky Palate. So good right out of the oven. I made them 4 at a time so that they would be fresh and ooey gooey each time. If those weren't good enough there's also a recipe for Candy Bar Chocolate Chip Cookie Sandwiches. Good grief, I think I hear the Reese's calling my name now. Think I'll try both of these versions out with the mini versions of the Oreos and candy bars. And to send you right into heart attacker mode, how about this newest cookie from Picky Palate called Peanut Butter Butterscotch Chippers. Good thing I'm showing some restraint and have been hitting the tread mill lately. Hope your day is saaa-weeet! TGIF everyone! I have a few more pages from last week. 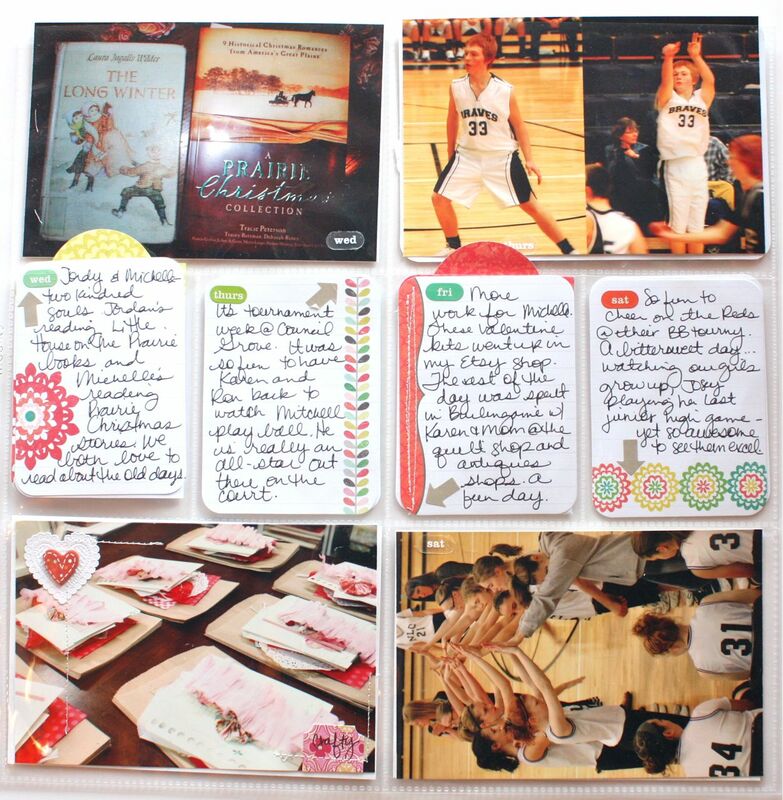 These were inserts I added to my Project Life pages using We R Memory Keepers divided page protectors. I find mine at Archiver's and Scrapbooks, Etc in Topeka, Kansas. 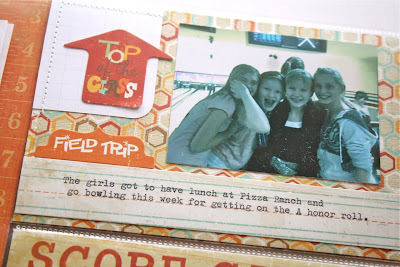 This first layout features the girls getting off the bus. We have about a month of free days with no sports so it's fun for me to watch the girls get dropped off at home by the bus. A snippet of journaling using a piece from the Project Life journaling cards, typewriter journaling and mini staples. Another one page spread of a bowling party and lunch the girls went to last week. The largest 6 x 8 area was used to hold some school papers. 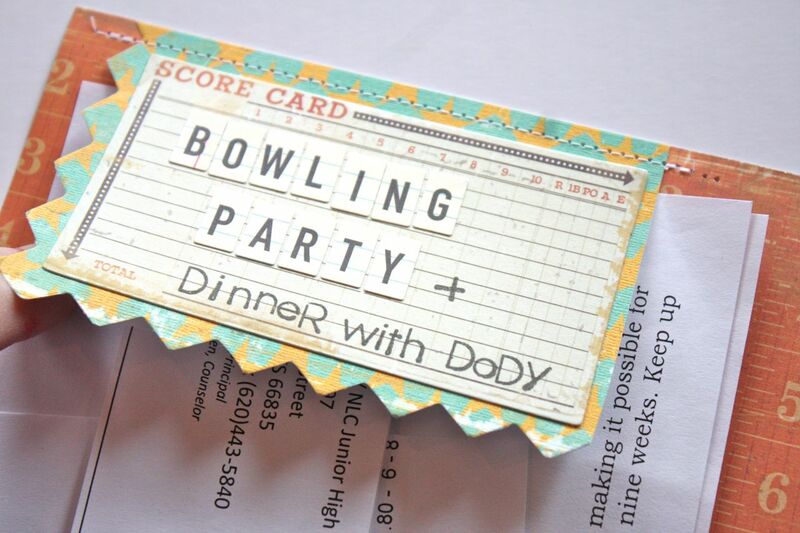 I used a piece of patterned paper and a sticker that I added sticker letters and stamping to to hold the papers down. 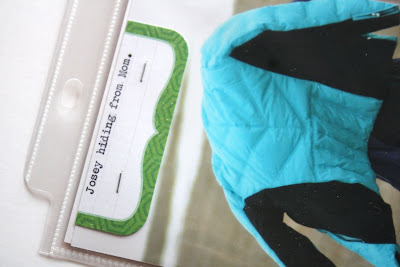 Simply stitch across the top to make a flap. Love this technique. 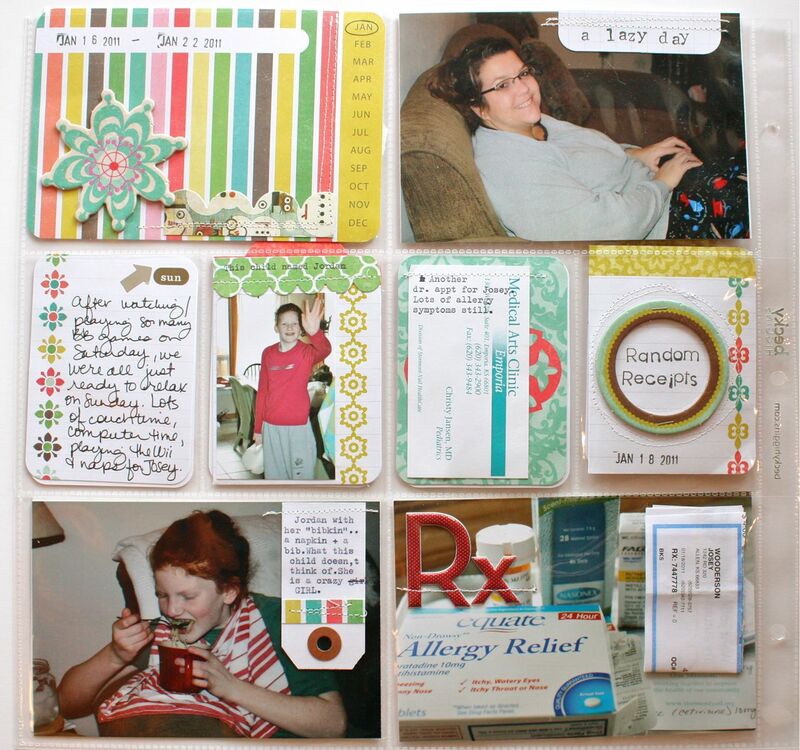 One of the 4 x 6 inserts with smaller photo, typewriter journaling, and a sticker adhered to a cut up gridded journaling card from Project Life. Machine stitching was added to the corner. Here, I used my typewriter to type on some stickers. Just cut the sticker out and leave the adhesive on the back. These were also stitched onto the 4 x 6 inserts with my sewing machine. And here's a two page spread using more of the divided page protectors. Last Friday the girls had a dance....and Eric and I went on a date to a Chinese restaurant we've been frequenting since we started dating when we were 15. Still the same ol' place, same menu, same decor. The left page shows the dance photos....the girls getting ready, eating supper and a few shots of their friends. 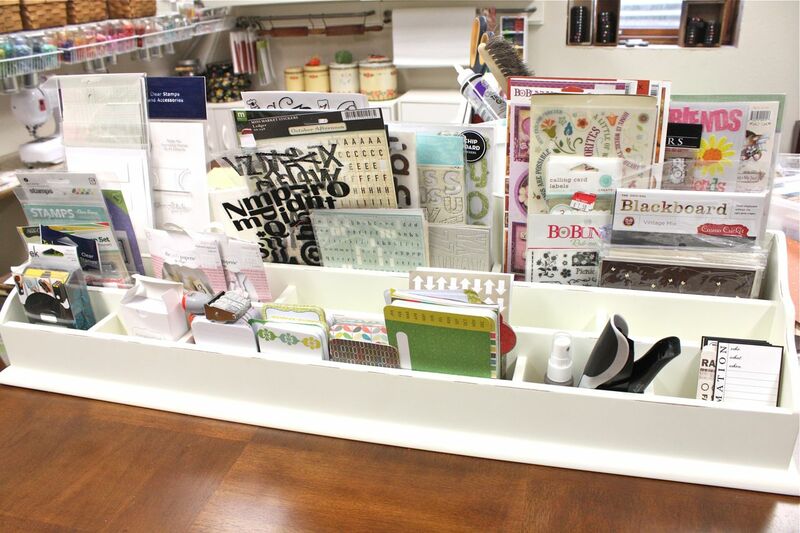 Papers and chipboard accents are from Crate Paper's Restoration line. For the journaling accent on the right side, I typed on a Project Life journaling insert then added some stickers. I chopped it off and stitched it to my photo. On the right layout, I featured our date photos from the restaurant. 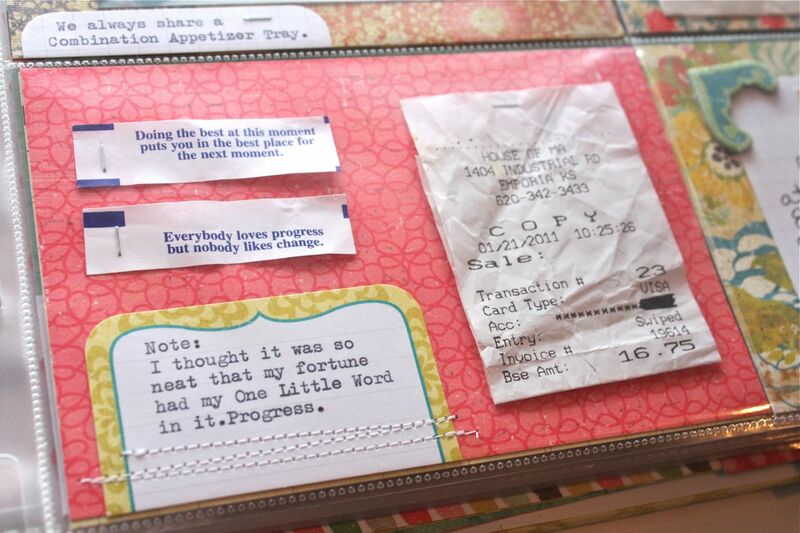 Here I included our receipt and our fortunes from the fortune cookies. I added a little journaling about how cool it was that my fortune featured the word progress....my One Little Word from Ali Edwards concept. For the larger 6 x 8 area, I used another Project Life journaling insert to create another flap to hold down the place mat from the restaurant. A little typing, a chipboard accent that was stapled on and more machine stitching to keep the flap in place. This way the papers can be removed to be viewed then tucked back under the flap. Okay, that does it for last week's layouts. 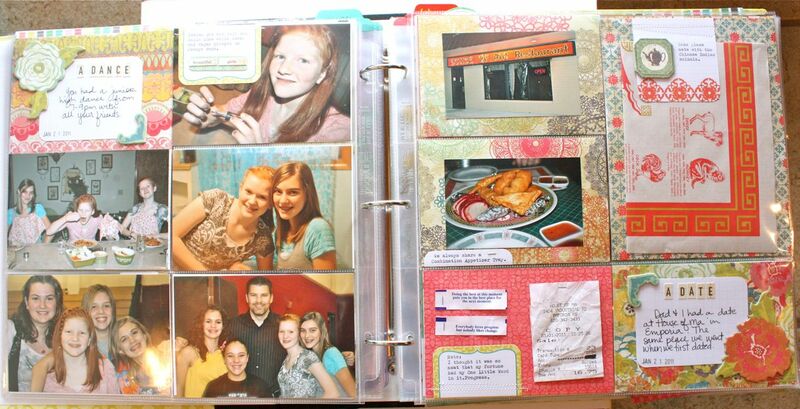 I had so much fun scrapbooking....again I spent about 4-5 hours total for all of my layouts. Totally workable for me. I handed my album over to the family one night while we were watching tv. 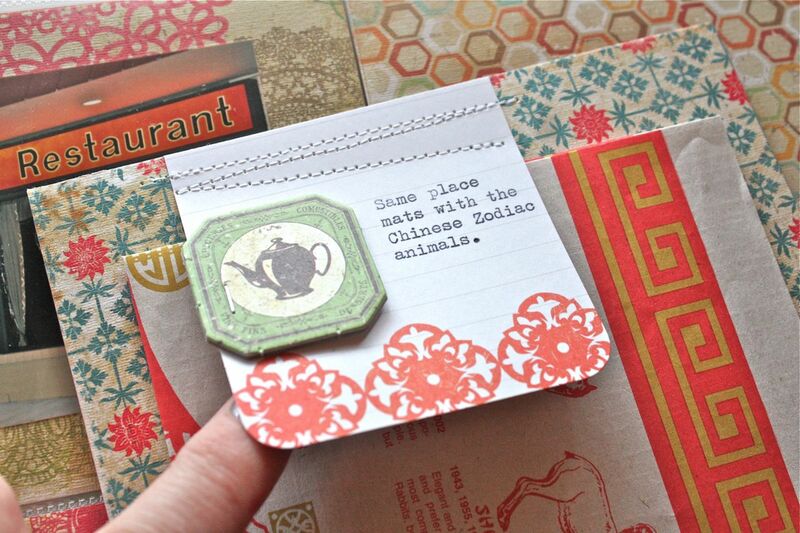 I loved how they pulled out the little journaling cards and looked at all the details. The girls always hate it when I take so many photos but they sure do love to find the photos of themselves in my albums. My album now reminds me of those interactive children's books where you lift the flaps and pull out little tags....it makes it so fun. And just imagine what it will be like 20 years down the road. I know the girls will love that Mom made these albums. 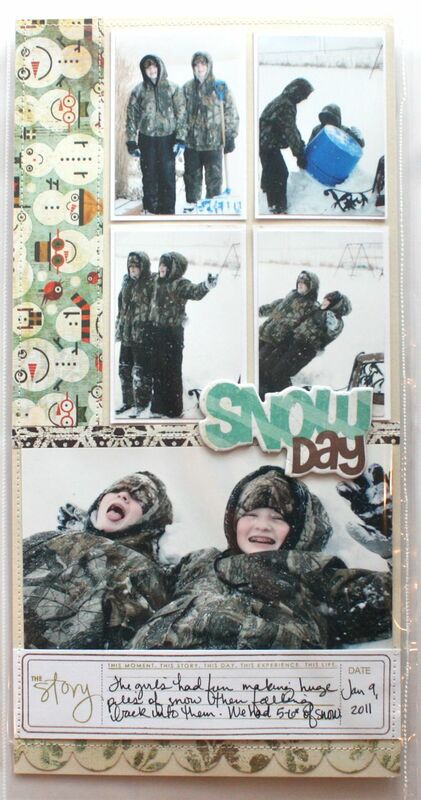 Have I told you how much fun I'm having with my scrapbooking this year? Definitely making progress. Here's my Week 3 layout for this year. For my main weekly insert, I added a chipboard accent and sewed on a strip of scalloped patterned paper. 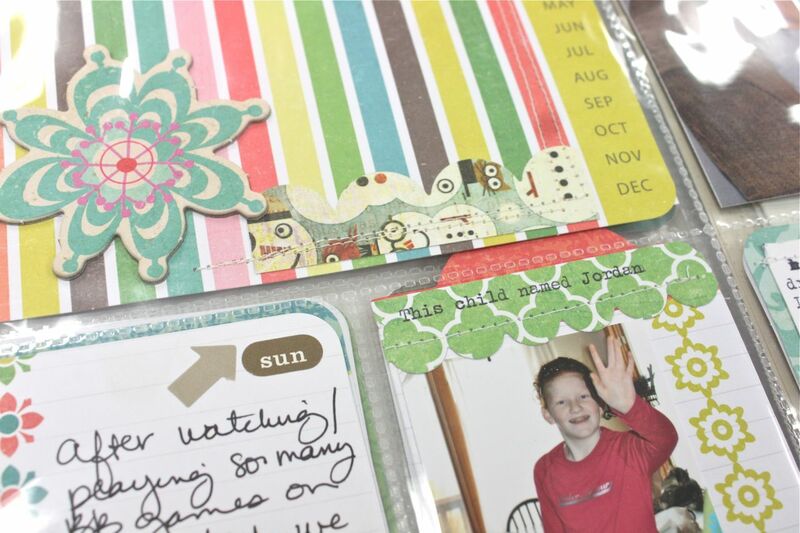 On the smaller journaling insert with Jordy, I added a small photo and sewed a strip of patterned paper from the Project Life Amber Edition kit to the top. I first typed a blurb using my vintage typewriter, found at the thrift shop. Note on vintage typewriters: You can find these for $20 or less at at antique shops and thrift stores. Ask the clerk if you can try the typewriter out to make sure all the letter keys work. If the ribbon is dry, look at office supply stores for a new one. I found one for mine at Staples for under $5. Just bring the old ribbon to compare. My new ribbon plastic spools did not wind the ribbon right for my old typewriter so I just re-spooled the new, juicy inked ribbon onto my old spools. Messy but so worth it. I love the look. Here I've sewn a doctor appointment card onto a blank journaling card. First I typed a blurb. On the right I stamped the *random receipts* with a Hero Arts alphabet and added circles of machine stitching. I then stapled on a chipboard circle accent piece. 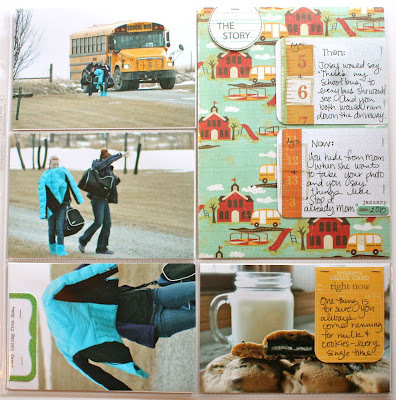 This piece is one of the folded journaling cards. Receipts from the week are folded and tucked inside with a note about the current recession. 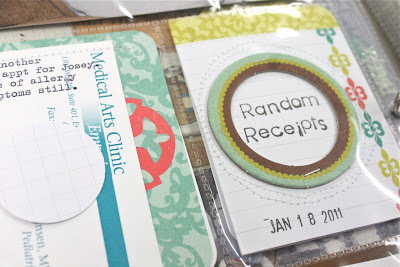 Date stamp is from the Project Life kit. Here I've stitched a small tag from my Etsy shop right onto the photo. 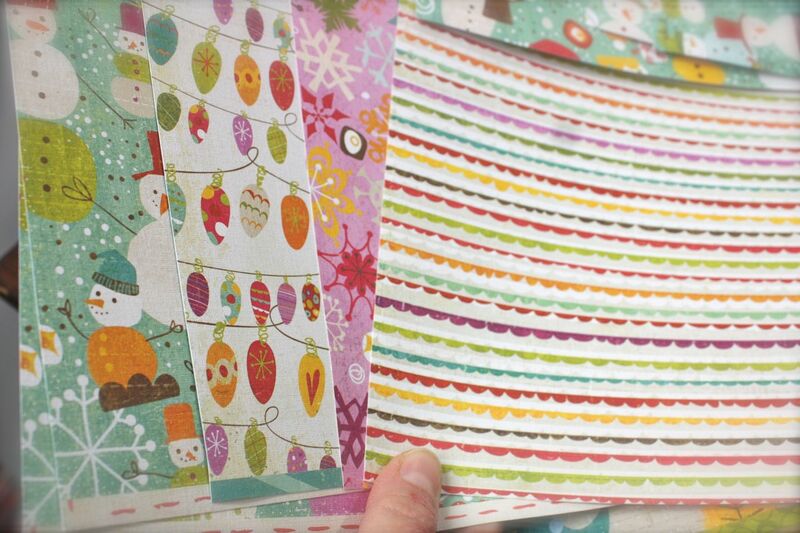 I first typed a blurb and stitched on a strip of patterned paper from the kit. 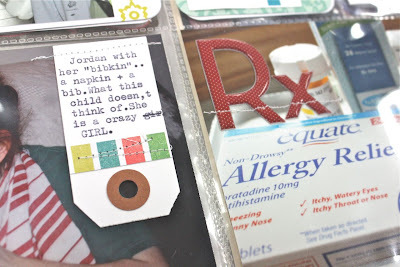 On the right I took a photo of all of Josey's medicines then stitched on sticker letters to spell Rx. Love that look and the sewing machine goes right over the letters. On the left I've got another folded journaling card. 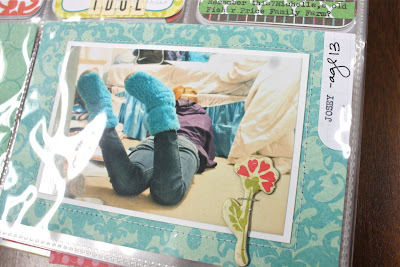 Inside are two blurbs about the girls that coordinate with the photos of their feet. Tag was stamped with alphabet stamps on a tag from my Etsy shop. The gift is a chipboard accent. The middle journaling accent has some alphabet stickers with stitching on the top. On the right is a small photo of my Fisher Price Farm, added as a reminder of a toy we have. 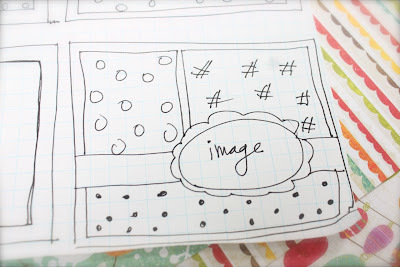 A snippet of typewriter journaling was added to a strip of patterned paper from the PL kit. 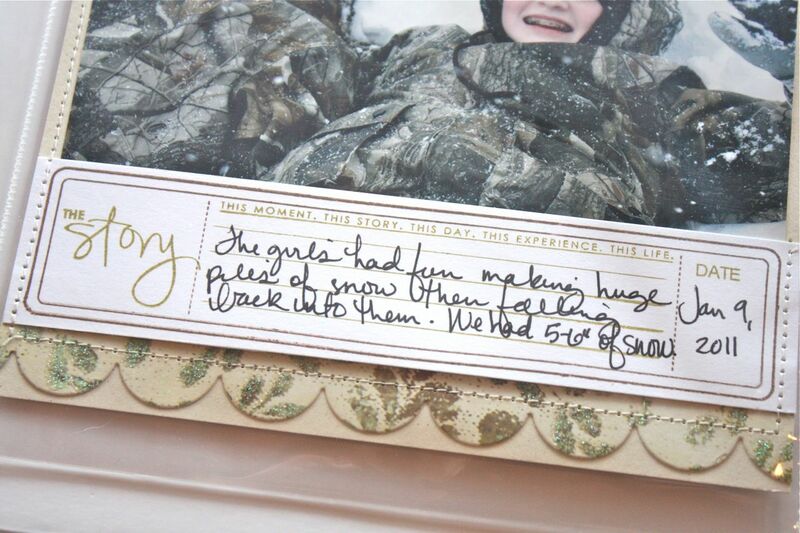 This shows one of the photos of the girls from the week, matted on white cardstock with stitching around the photo. I used a snippet of a journaling card with grid marks that is sold separately for Project Life....typed Josey's name, wrote her age and stapled it to the insert. 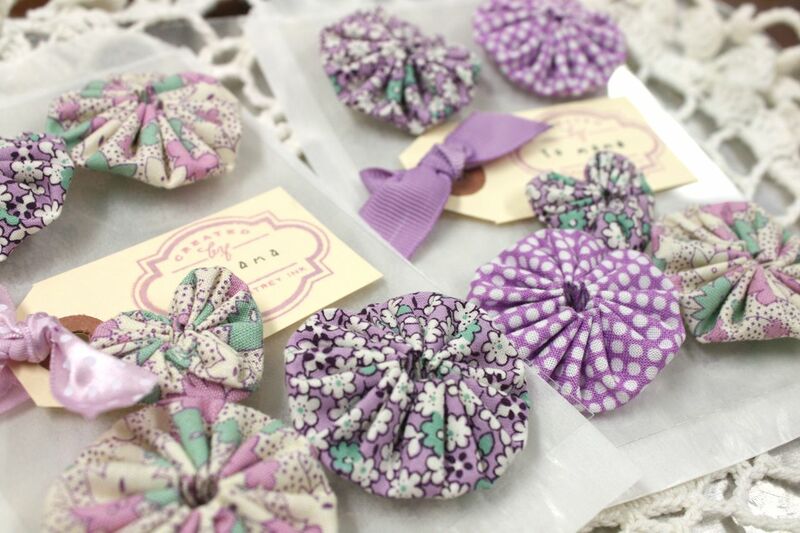 The chipboard flower was stapled to the photo. This two page spread took me about 2 hours to complete. Not too bad for a week's worth of photos. I'm estimating that with the main, two page spread and my insert pages that I add...I probably spent about 4 hours on my album last week. Very reasonable amount of time and I felt like I was still able to be creative and get scrappy with my album. Perfect for me!! Stay tuned tomorrow for the additional insert layouts I added to Week 3 of my album. Also, scroll down to see additions I've made to my Valentine Exchange post. Cute stuff. Thanks for stopping by today! 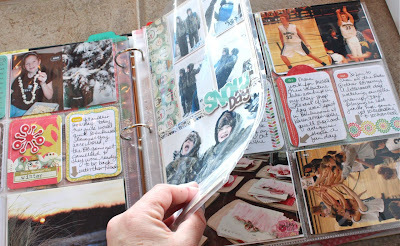 I am so excited to share more of my scrapbooking with you. Today I have Week 2 of my Project Life album to show you. Longgggg post, so if you stay with me....good for you! First, I wanted to share some thoughts on how my scrapbooking has progressed this year. (Progress being my One Little Word for the year). Last year I had full intentions of scrapbooking but I hardly did any pages other than adding plain photos to my Project Album. Which I stopped in May due to my gall bladder issues, vacations, softball games, trips, etc. 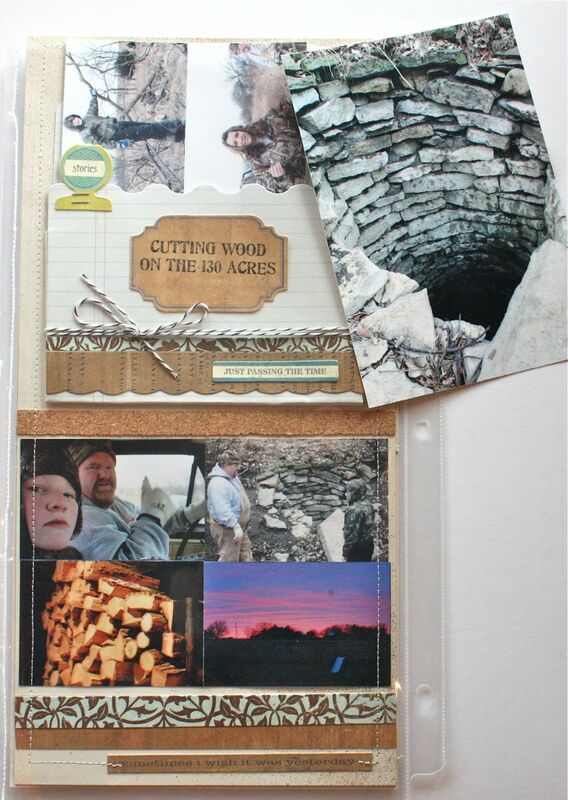 This year I wanted to make some major progress with my scrapbooking. So I've done a lot of thinking about how I can get all the scrapbooking done + my other Design Team responsibilities + run an Etsy shop + devote time to my family, etc. 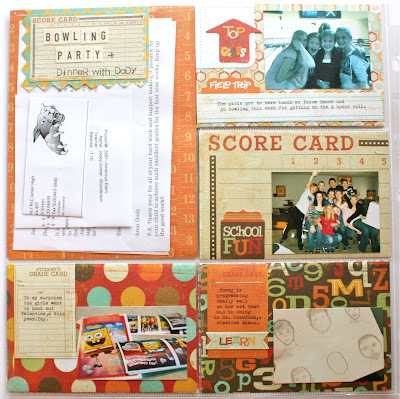 I knew Project Life was the answer because of it's all inclusive scrapbooking system. But as I completed my first week, I knew that I wanted more. I wanted to add more creativity to my pages. 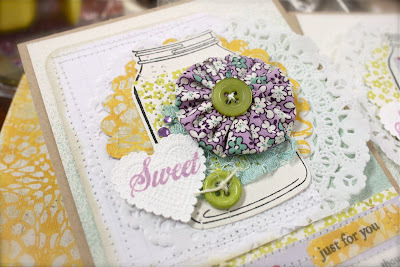 More scrappy stuff using supplies from my stash. More stamps. 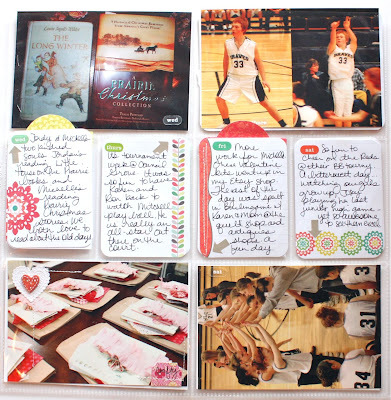 As I scoped out other blogger's Project Life pages and the gallery at the PL Community, I began to see how others personalized their PL pages. They were using little snippets of receipts, tags, smaller photos, creative journaling, old typewriters for journaling, instant camera photos, etc. And I LIKED it! A lot. Some of my favorite inspirations came from Ali Edwards, Lisa Truesdell and my good friend Heather Nichols. So that brings me to how I want to do my Project Life album now. 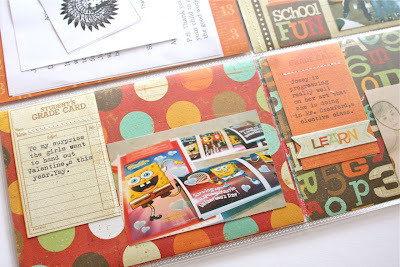 I had thought that I simply wanted to add the photos, do the journaling cards and then do lots of other insert pages that were full blown scrapbooking. However, I have to be realistic. I won't have time to do that and keep up with it. And I'm not good at catching up. 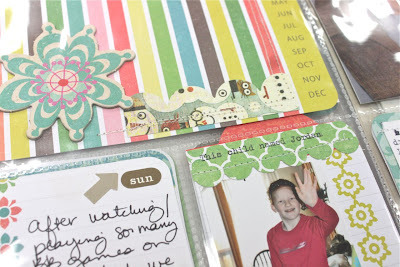 So I've changed my approach and here's what I'm gonna do: I am going to get scrappy with my Project Life daily photos. I'm going use products from my stash. I'm going to sew on my pages. I'm going to use my old typewriter for journaling. 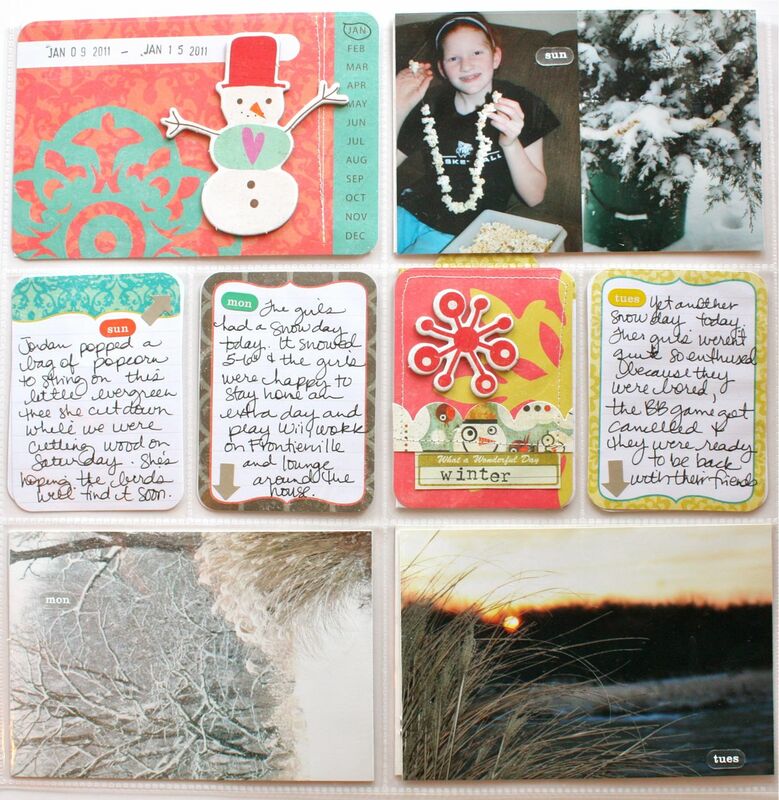 I'm going to cut up Becky's journaling cards and get creative with them. Plus I'm going to add in additional pages of my own in between the PL pages. I'm going to treat the two page layout of one week as a scrapbook layout....blending it all together to look like a layout. To be honest, full size 12 x 12 layouts intimidate me. I think it's because I'm used to making cards which are a smaller size. With the PL pages, the size of the inserts are perfect because they're about the same size as a card. Not intimidating at all. But to get more scrappy with my PL album, I had to switch gears. I need to scrap in my studio now to be close to my supplies. So I've moved my album to my studio and set up shop on a second table. I re-purposed this Pottery Barn unit (which was originally listed in PB Teen as a makeup table organizer a few years back) and it now holds my basic scrapbooking supplies. I will tweak it as needed but for now it has my stamps that primarily used for scrapbooking (lots of Ali Edwards stamps from Technique Tuesday), letter stickers, my Tiny Tim stapler, a label punch and front and center are my journaling cards + extra supplies from the Project Life kit. It's all right in front of me and I'm loving this process. Note: Instead of printing my photos just daily now with my Canon Selphy, I've also been printing my photos in batches at my local developer and scrapping one week's worth of photos . This way, I am treating one week as a full scrapbook layout. This week's two page spread took me about two hours to complete. So with all that said, I'll try to keep the actual photo part of this post shorter. 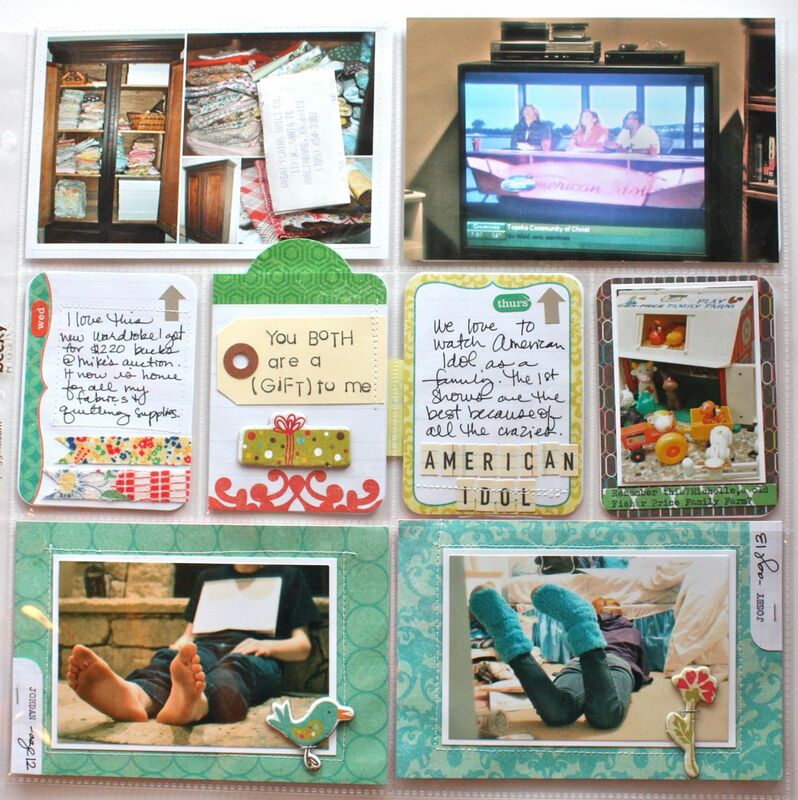 Here is my Week 2 photos of my PL pages, which includes a 6 x 12 insert page in between. And here's how it looks with the 6 x 12 page insert, each side having a layout. 6 x 12 page protectors are from We R Memory Keepers. Here's where the scrappy details come in to play. Sewing, chipboard accents and stamped labels. 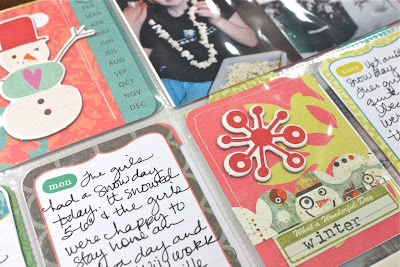 I love to use my small alphabet stamps for journaling. They are an essential tool for me. On this photo, I added a few hearts and stitched right on the photo. Here's a closeup of the 6 x 12 insert page. This is a journaling block created with Ali's stamps from Technique Tuesday. And the back side of the 6 x 12 layout. The ledger pockets are from KI. See the photo of that old stone well? We found that while out cutting wood one day. I must get the story of it from my dad. I never knew it was there. It's all about the stories, right? Okay, that's wayyy too much typing, even for me. 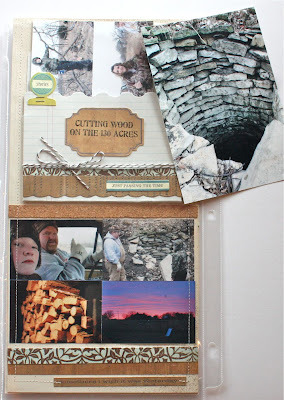 How are you coming along with your Project Life album? Are you keeping up? Let's keep each other going, we can do this. 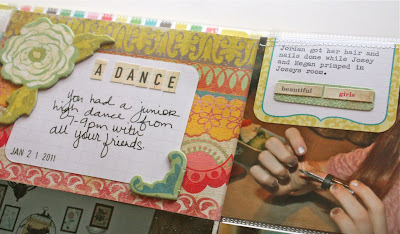 Stay tuned this week for Week 3 of my PL album....and a few more insert pages that I did of some fun events last week. Thanks for stopping by!